A UN official has resigned after saying the UN had pressured her to withdraw a report accusing Israel of apartheid over its treatment of Palestinians. The report was published by the Economic and Social Commission for Western Asia (ESCWA), led by Under Secretary General Rima Khalaf. She had said it was the first to conclude Israel was a racist state. UN Secretary General Antonio Guterres had distanced himself from the report, saying it reflected its authors' views. As of Friday, it was no longer visible on the ESCWA's website. 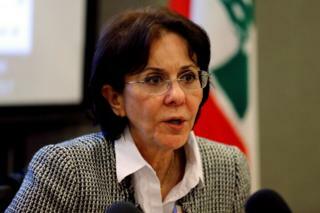 Speaking in the Lebanese capital Beirut, Ms Khalaf, a Jordanian, said she had submitted her resignation to Mr Guterres after he insisted on the report's withdrawal. "We expected of course that Israel and its allies would put huge pressure on the secretary general of the UN so that he would disavow the report, and that they would ask him to withdraw it," she was quoted as saying by AFP news agency. Media captionIsrael's Deputy Foreign Minister Tzipi Hotovely: "Israel and apartheid have nothing in common." Israel has condemned the report. "The attempt to smear and falsely label the only true democracy in the Middle East by creating a false analogy is despicable and constitutes a blatant lie," Israeli UN Ambassador Danny Danon said in a statement. The report itself said it had established on the "basis of scholarly inquiry and overwhelming evidence, that Israel is guilty of the crime of apartheid". It was published on Wednesday by the ESCWA, which promotes economic and social development in 18 Arab countries, and is based in Beirut. In 2014, the then US Secretary of State, John Kerry, warned that Israel risked becoming "an apartheid state" if a two-state solution to its conflict with the Palestinians was not found soon. Relations with the Palestinians have been a major factor in Israel's foreign and security policy. The Palestinians in the West Bank and eastern Jerusalem have lived under Israeli occupation since 1967. While Israel pulled its troops and settlers out of Gaza in 2005, the United Nations still regards it as part of the occupied territories. The settlements that Israel has built in the West Bank are home to nearly 500,000 people and are deemed to be illegal under international law, although Israel disputes this. Update 5 April 2017: The text referring to occupied territories has been updated to include details of Gaza.